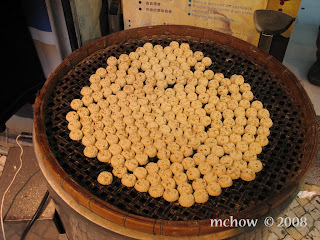 i'm a little unsure as to how to start off this food blogging thing, but as i flipped through the 2000+ photos i took while in hong kong, i came across these ones of almond cookies in macau. 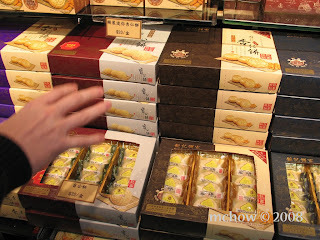 these macanese delectables are one of macau's more famous exports, along with eat jerky, and the best egg tarts i've ever had in the world (though i've never been to portugal so i might be mistaken... humour me for now). 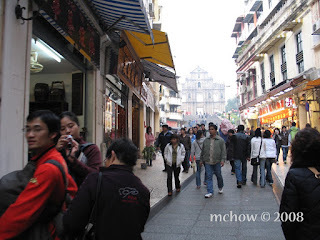 the main street leading up to the remains of st. paul's church in macau are lined with shops that sell these cookies. barkers for the stores literally shove them in your hands to lure you into buying more. i think i got slightly ripped off ($100 MOP for 4 boxes) but i didn't really care cause this was the real deal. there are a few major competitors on that strip but the one i went to was pastelaria koi kei. made of mung bean powder, sugar, almonds, vegetable oil, peanut butter, milk powder and water, they're slightly toasted on that big round toaster plate thing when they hand them to you. [that's the ominous hand of mr. frawley who likes to ruin pictures i take]. imagine a light, slightly sweet, dry and crumbly biscuit, flavoured with almonds. and sometimes mixed with walnuts, coconuts, or whole almonds... and imagine sipping some hot tea or almond milk with one of these suckers and you're soaking in it! though some liken these cookies to eating chalk, i say, to each his own... and i like chalk.